Facebook has been on my mind this week. First of all it published some advice to the Meeja on how journalists can get the most out of using the social network which, while a little heavy on the exclaimation marks, seems useful and has some good pointers. It’s a best practice guide for reporters who want to know more about using Facebook in a professional capacity, to promote their work, seek feedback, guage public opinion, crowdsource ideas and more. Plus it allows them keep their personal/professional networking somewhat separate (we’ve all seen examples of what happens when Facebook Status Goes Bad). Then, via Paul Bradshaw’s OJB, I came across a blog post on the BBC College of Journalism site that made me reconsider all of the above. 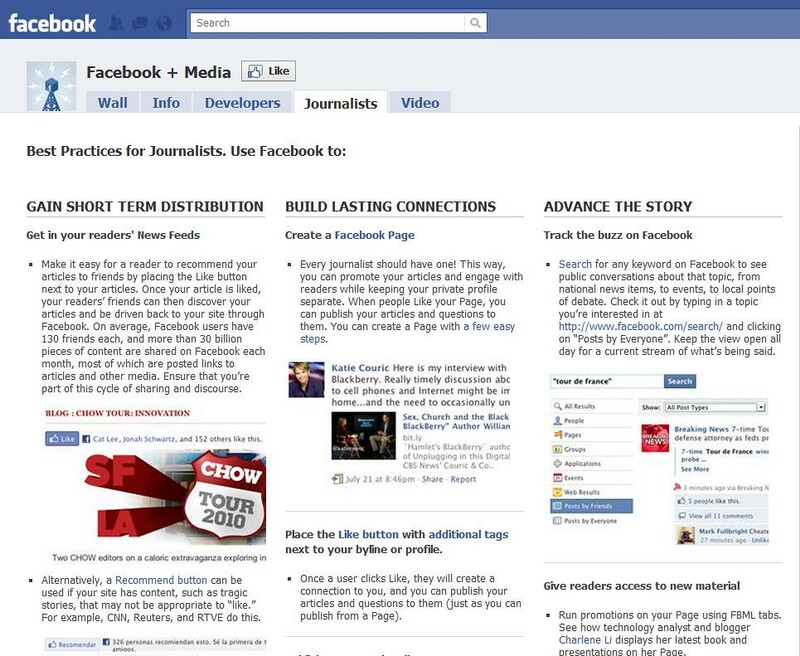 First up, the new Facebook media guide. I like this idea because it offers good, entry-level engagement opportunity. Editorial types who perhaps aren’t wholly signed up to the idea of using platforms other than print to share news probably do use Facebook, for communicating with friends, sharing information, playing games, lurking and generally displaying their interests and intents. This means it’s a familiar, easy environment to try out audience interaction and engagement. I think some journalists could find having their own professional Facebook page very useful, although early adopters in the newsroom will already be using it, and Twitter, Foursquare, forums and blogs, plus their own title’s website, to engage anyway. 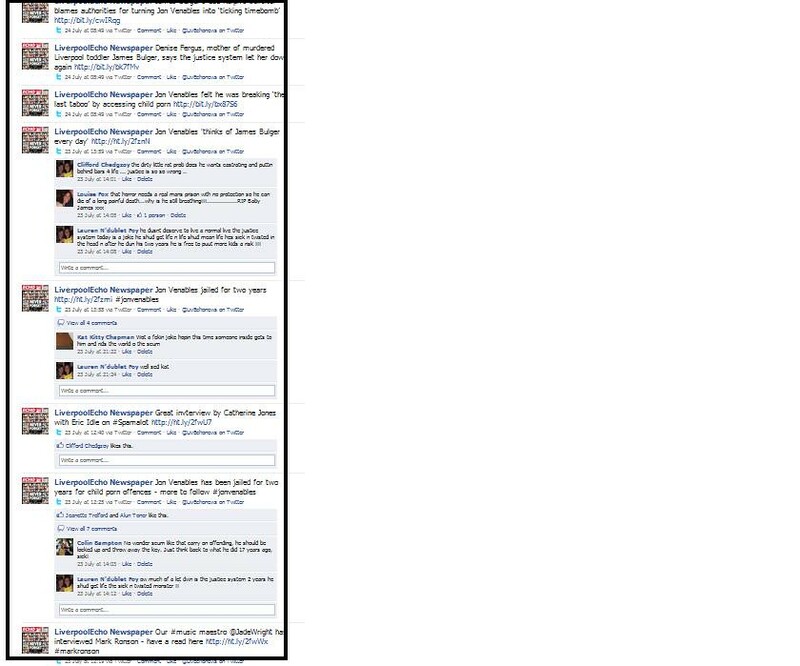 Meanwhile, over on the Collegeof Journalism site, there’s some fascinating Facebook research. Drawing on the views and useage of 20 19-39-year-olds, who were asked how they consumed news via social media, it reveals that Facebook is their main network, used on mobile (on-the-go contact) and desktop/laptop (deeper interaction, engagement and consumption of news). Looking at the Liverpool Echo’s Facebook site to see what was being sparking people’s interest, we currently have a platform that is more about consuming than conversing. This is the ‘official’ Echo site, although by no means the only one.A few years ago, when regional papers went all Web 2.0, everyone started a Facebook page for their title. Then several other everyones at the same title went and did the same thing. And then a lot of them left, without telling a single colleague that those pages even existed, let alone passing on a login. So you can have a number of Facebook pages/groups/fan pages that revolve around the same thing. If you search Liverpool Echo on Facebook you’ll find, among other things, a home delivery page, some non-associated Echo sites, and marketing pages for specific events or campaigns. This particular Facebook page was established as the main Echo one in February 2009; it has nearly 1,400 friends. The online chat is always on, and I frequently get IM-ed by the Echo’s ‘friends’ who see the paper is online for chat and want to know the latest news – it happened twice as I was writing this post. Some reporters use it for crowdsourcing, and some of the more outrageous gangster stories can lead to interesting comments but we could do so much more with it, given more time and more people. We get comments our links, which are bit.ly links mostly auto-posted via Twitter to the site, or video/photos, but people tend to use the Like button a lot more than they leave comments – a LOT of links get liked, or shared. So I can see why Facebook’s media guide would say the Like button can be a valuable tool for gauging reader opinion. Monitoring Facebook is important. It’s also somewhat time-consuming (among other things, I accepted 45 friend requests to the Echo when I logged on). Looking after your social media presence is just as important as making sure your newspaper ncompanion website is maintained properly; if a lie can run around the world before the truth has got its boots on, then a critical tweet can become a meme before a title has even noticed someone’s sent an angry @ reply, and a a conversation thread can develop on your Facebook page that is entirely independent (and way more colourfully worded) of anything you’d allow on your brand’s homepage. Most of the national titles seem to have at least one dedicated editorial staff member who is the public face of community interaction. I don’t know anyone in the regional press with that specirfic remit but I may be wrong, although I’d imagine most titles rely on the digital editorial team to do a bit of everything – create multimedia content, manage the editorial look and content of the web pages, and interact across in-house and external digital platforms with audiences. I’d also imagine that if you asked most senior media executives about online relationship strageties, they’d think you meant their CRM. Which one of these two items – the BBC research or the How-to guide for Facebook – is more useful? For me, it’s the research. The guide is content; the research is context. So, as I said, I have some conflicting thoughts on Facebook. On the one hand, I can see the merit of more interaction but what I actually believe in is better interaction; if we don’t manage what we have well enough now, where is the merit in doing more? Of course, we should be improving and growing simultaneously.And yet, as the BBC research showed, Facebook users don’t necessarily want more or better – they just want what they want. The Like button can point us at that, but it can’t be all we rely on. But the research further shows – I think – that Facebook has a fundamental part to play in building a brand’s reach and social currency with an audience, but it only stretches so far – such as users still opting to check the veracity of a linked Facebook story on the title’s original homepage. So should we really trust a Like button? And if our audience doesn’t particularly trust news on a Facebook site, why think too deeply about pushing content at them, when they will visit the source to verify it anyway? I’m sending myself round in circles with this. I’m sure the answer is out there, somewhere.